Well-trained IDF troops and undercover police were ready for Arab rioters in eastern Jerusalem, whose Nakba "party" ended badly. Rioting Arabs in eastern Jerusalem may have gotten more than they bargained for on Sunday, “Nakba Day,” as a quick response by IDF and police appeared to effectively disperse the violent mobs and arrest ringleaders. An Al-Jazeera reporter had strategically placed herself at Kalandiya in the morning and reported live on the rioting, which she likely knew about in advance. The Al Jazeera camera showed a group of about eight IDF soldiers standing behind a wall that protected them from the hail of potentially lethal rocks that was aimed at them. Then, in a flash, several armored jeeps came careening into the camera’s field of view and the soldiers were already running fast toward the rioters, who scurried away as best they could. In a famous speech at the 1898 Second Zionist Congress, Zionist leader Max Nordau coined the term "muscular Judaism" to describe a Zionism that was partly about the creation of a more physically assured Jew as an alternative to the stereotypical weak, hyper-intellectual Jew. Nordau would probably had been pleased at the sight of IDF and police undercover units putting a quick end to the plans of rock-throwing rioters of eastern Jerusalem, who are still unwilling to accept the defeat that the Jewish army dealt their great-grandfathers, exactly 50 years after Nordau's speech. ...but ends just as quickly. 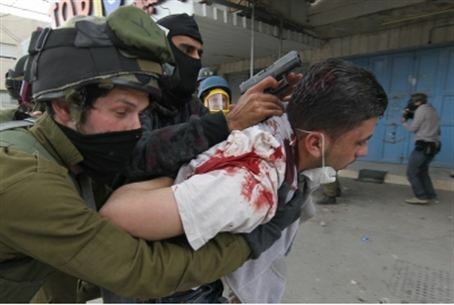 IDF soldiers and undercover agents charge and make an arrest at Kalandiya, as a cameraman follows. Soldiers and rioters wear masks for protection from tear gas and facial identification. It's all in a day's work for the unknown young IDF and law enforcement heroes of the 63-year-old Jewish State.